Hot on the heels of Flicker Alley’s release Abel Gance’s La Roue earlier this year comes another Gance masterpiece, J’Accuse. Described by Flicker Alley (erroneously, I feel) as “the first major pacifist film” (what price Civilization, War Brides, or the Danish films Lay Down Your Arms and Pax Aeterna? ), Gance’s World War I film is released as a 2-DVD set on 16 September. The DVD presents the 1919 original version (a re-edited and shortened release was produced in 1922), 166mins in length, restored by Lobster Films, working with the Netherlands Filmmuseum, using materials from Lobster, the Filmmuseum, the Czech film archive, and the Cinematheque Francaise. The film comes with a symphonic score composed and conducted by Robert Israel. 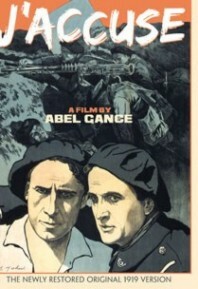 The extras include Paris Pendant La Guerre (Paris During the War), a 1915 comic view of life in Paris in wartime; Donald Thompson’s war reportage from the Battle of Verdun, Fighting the War (1916); and a booklet that includes an extensive essay by Abel Gance’s most dedicated champion, Kevin Brownlow. France’s pioneering filmmaker Abel Gance said that his definitive anti-war work J’Accuse (1919) “was intended to show that if war did not serve some purpose, then it was a terrible waste. If it had to be waged, then a man’s death must achieve something.” After seeing the film, a Czech journalist declared that if it could have been seen around the world in 1913 the First World War might not have happened. J’Accuse was the only “peace film” to be made in Europe during World War I. Gance, who had served briefly in that conflict, returned to active service in 1918 to film harrowing battle scenes of soldiers actually under fire. Parts of the film were shot during the battle of St. Mihiel, one of the most significant of the war. Also, for the famous “March of the Dead” sequence at film’s end, Gance used real soldiers home on leave from the front – most of whom were killed within the following weeks. Some titles are taken from real letters written by soldiers to their families. The film stars Maryse Dauvray as Edith, a young Frenchwoman who is in love with a poet (Romuald Joubé) but is forced by her father (Maxime Desjardins) into a marriage with a much older man (Séverin-Mars). Edith is captured by the Germans and endures multiple rapes that result in her becoming pregnant. Edith’s husband initially thinks that the poet is the father of her child, and the story ends in tragedy with both men seeing action in the trenches. Historian Kevin Brownlow, who dedicated his book The Parade’s Gone By to Gance, described J’Accuse as “a miracle film.” It introduced techniques developed by Gance including rapid-cut editing and expressionistic camerawork and lighting. The film, a huge success in Europe, originally ran 14 reels (three hours) but was truncated to ten reels for its American release, damaging its continuity and preventing it from becoming a success in the U.S. The re-editing blunted the anti-war slant and gave it a happier ending. The reconstruction, a Flicker Alley Digital Edition from the Lobster Film Collection, began when Gance’s friend and heir Nelly Kaplan provided a 35mm master print of a restoration by the Cinematheque Francaise, taken from a shortened reissue in 1922. Incomplete original prints were sourced from the Lobster Collection and the Czech archive in Prague. Happily, an almost complete copy of the original edit (although in poor condition) was found in the Netherlands Filmmuseum. All these elements were transferred to high-definition video and conflated by the Netherlands Filmmuseum to make the best and most complete edition possible.